 Top oil thermal modeling & monitoring. 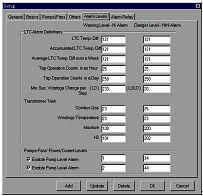  LTC differential temperature monitoring.  LTC tap position monitoring.  Hot spot temperature monitoring.  Oil pumps/cooling fans monitoring.  The loss of life.  The other ten analog inputs for pressures and levels monitoring. The thermal modeling, Hot Spot temperature calculation, and the loss of life are based on the IEEE 57.115-1991, C57.91-1995, C57.92 -1981. 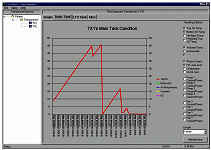 The module does the data reading, modeling, and alarm checking every 5 minutes and all the data is saved in ODBC database for further off-line analysis. The module is standalone OPC server with data access and event/alarm interfaces can run as NT service. You can trend any combination of the measured data in a past week, month, quarter, and year, etc. Each transformer monitoring module can handle all the transformer tanks in a substation.